An old friend is down from Las Vegas for the weekend. 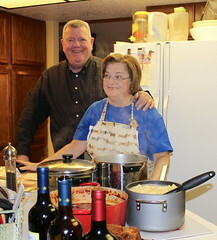 We ate out Friday night and had a party Saturday night, so tonight, the last night of his visit, will be a quiet dinner at home. Ditalini’s making a salad and I’m grilling steaks and veggies. We also have a loaf of foccacia bread topped with olives and parmesan, which I hope we’ll have room for. If not, I can heat it up in the morning for breakfast. 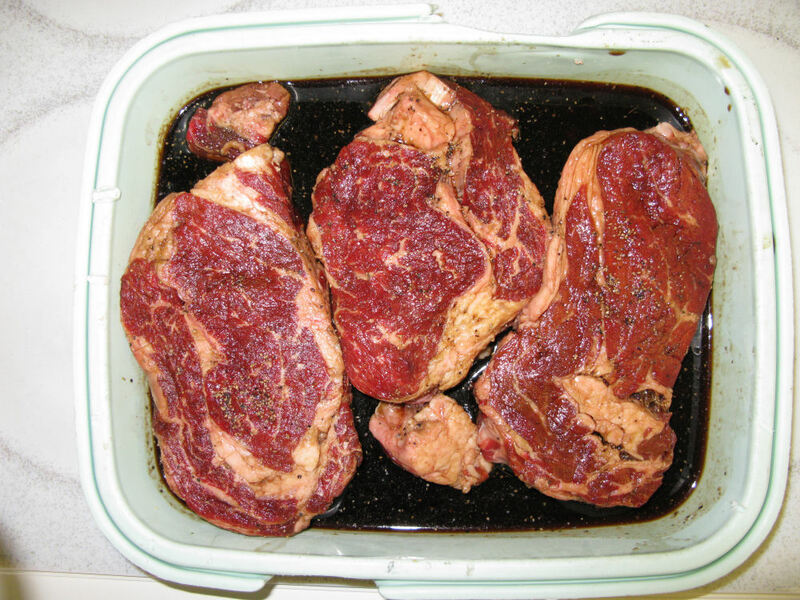 Our steaks, three boneless ribeyes, are marinating in Aloha Barbecue Sauce. We picked up a taste for Aloha when we lived in Honolulu; fortunately for us there’s an oriental food store in Tucson that carries it. 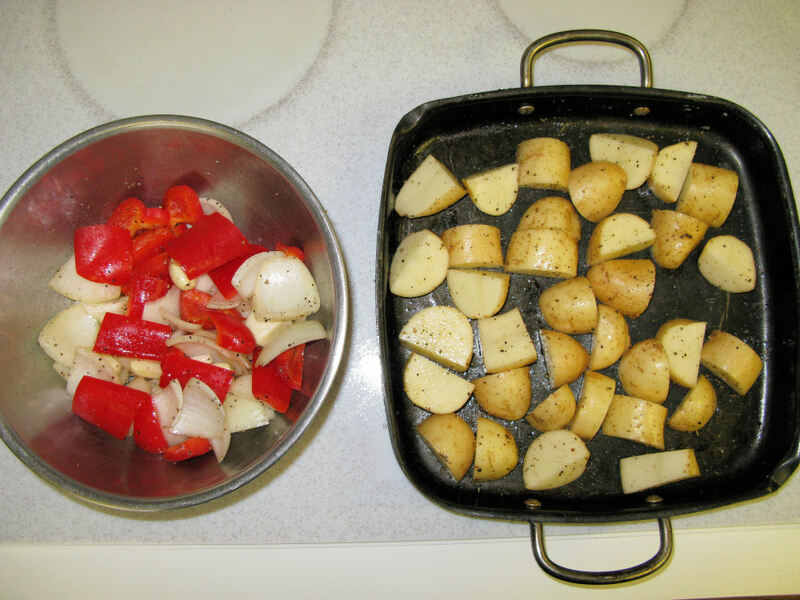 For the veggies, I’m grilling potatoes with onion, red pepper, and garlic. I’ll start the potatoes first, then add the rest after 20 minutes. Here are the veggies, brushed in olive oil with a little salt and pepper sprinkled on top. I use the square pan for grilling . . . it’s black anyway; I just have to remember to use hot pads when I go to grab it off the grill. Tonight I’m using the propane grill, only because I don’t want to take the trouble to fire up the Weber charcoal kettle grill. I’ll set the flame on medium and grill with the lid closed, just like I would with the Weber. I’ll grill the potatoes for 20 minutes, flipping them with a long-handled spatula at least once, then add the other veggies to the pan. At the 30-minute mark the veggies come off and the steaks go on, 5-6 minutes per side for rare to medium rare.